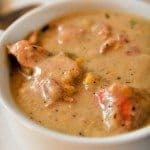 Southern Chicken and Dumplings are easy to make at home with this classic, family-favorite Southern recipe. Now with Instant Pot and Stovetop instructions! 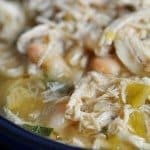 Chicken and Dumplings make the perfect, comforting meal anytime of the year, but especially when the weather is chilly. As I made her recipe for chicken and dumplings, I remembered how she would hum as she cooked. As she rolled her dough and gently dropped it into the soup, she would just hum away. Usually it was whatever song had been played in church the Sunday before and then sometimes it was the song, “Babies Got Her Blue Jeans On.” I have no idea why she loved that song so much, but I loved to watch her when it came on the radio. She’d always get the biggest grin. Her kitchen wasn’t as big as a minute, but there she’d be cooking and humming and showing me how to get the dough just right. “It’s not the same as biscuit dough, now, ” she’d say. “Be sure not to overwork it. You don’t want your dumplings to sink.” She always gave the best advice – for recipes and everything else. So, here’s her Chicken and Dumplings recipe. I’m sharing a family treasure. And please, be sure not to overwork your dough. Southern Chicken and Dumplings are easy to make at home with this classic, family-favorite Southern recipe. Add the chicken to a Dutch oven. Cover chicken completely with water, plus about 3 inches. Bring the chicken to a boil over low heat until the chicken is very tender, approximately 2 hours. Remove the chicken from broth and pull into strips, returning to broth, discarding all but the meat. Add salt to the broth and increase to a medium heat to bring the broth to a boil. For the dumplings, mix together flour, Crisco, buttermilk, and water together to form dough. Pour the dough onto lightly floured paper towels and roll to about 1/4-inch thickness. Cut dough into 1 inch strips and pinch off 1 1/2 inch pieces. Drop the dough pieces into boiling broth. Stir after every few additions of the dough pieces to make sure they are submerged in the broth and able to cook. Add butter and milk, stirring to combine and often while cooking. Allow to gently boil for 3-5 more minutes, or until the dumplings are completely cooked. Remove a dumpling and cut in half to test for doneness, if needed. Arrange the rack insert inside the Instant Pot. Place the whole chicken onto the rack and sprinkle with the salt. Add 3 cups of clean water to the Instant Pot. Secure the top to the Instant Pot, close the vent at the top of the Instant Pot lid. Set the time using the Poultry button and reduce the amount of time to 25 minutes. Once the Instant Pot reaches pressure, the chicken will cook for 25 minutes. Allow the pressure to naturally release over the next 15 - 20 minutes. Carefully remove the lid of the Instant Pot and lift the rack insert out of the Instant Pot carefully transferring the chicken to a cutting board or platter. 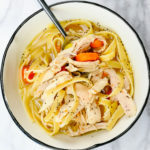 Remove the meat from the chicken and return it to the Instant Pot broth. Press the Saute button on the Instant Pot and bring the chicken and broth to a boil. Meanwhile, in a medium bowl, mix together the flour, Crisco, buttermilk, and water to form your dumpling dough. Pour the dough onto lightly floured paper towels and roll to about 1/4-inch thickness. Cut dough into 1 inch strips and pinch off 1 1/2 inch pieces. Drop the dough pieces into boiling broth. Stir after every few additions of the dough pieces to make sure they are submerged in the broth and able to cook. And that’s how you make the best chicken and dumplings you can imagine. 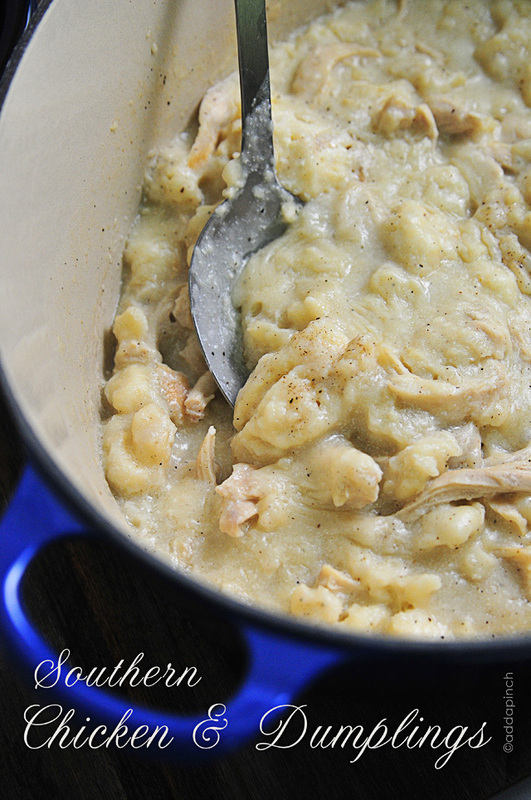 I promise you, if you like chicken, you are going to love these chicken and dumplings. Without a doubt! But I do wonder what memories Little Buddy will have of me when I’m cooking? It’s definitely my happy place. I think I’ll crank the music up a little louder when we’re cooking tomorrow. And hum a little more. This looks so yummy! We didn’t have a rolling pin growing up so we used the pinch a bit method for everything from making biscuits to dumplings, cookies, or whatever we cooked that required one. Thanks so much for sharing such a treasured recipe with us. I can hardly wait to try it. Wow, this looks like a little bowl of heaven. Love your recipes! One of my favorite southern dishes! Especially if I am not feeling well. 🙂 It just seems to settle just right on an upset tummy! My dumpling recipe is a little different – but I agree with you, it is a treasure. I probably make it once a week during the winter. I’m German – and our version is called Nookala. Crisco is a brand name of vegetable shortening, I’m sure any kind will do. I made the broth first with onions, celery and carrots. Strained it and then followed your recipe. I got a TON of compliments! The dumplings are a keeper! I think I would add a dash of poultry seasoning to them though. I know, grandma might cringe at that, huh? I do the same with the broth and drop the dumplings by the teaspoonful. The best flavor and yummy! Just wanted to say that the print feature you have here is EXCELLENT. So many options! I’m confused. Is there butter in the dumplings dough AND the broth. The recipe states mix flour crisco, buttermilk, water and butter to form dough. Then later it says add milk and butter and boil. I don’t see where amounts are specified. Am I missing something? Thanks so much for your question, Kari. Sorry it was confusing. The butter is only in the broth. I’ve updated to clarify. Thanks so much! What a touching story! Makes me miss my Great Grandma, she made the most phenomenal chicken and dumplings. Love chicken and dumplings. Had to laugh….I grew up with a dropped dumpling. Husband grew up with rolled out dumplings. He accuses me of being a Yankee. I then demand to know why he doesn’t eat grits! LOL Running gag for 25 years of marriage. There’s something almost magical about learning a treasured family recipe from our Grandmothers – now that mine’s gone, it always makes me feel closer to her to make one of our family’s recipes. 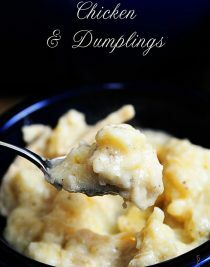 I can’t thank you enough for posting THIS recipe – I grew up with drop dumplings and have been looking for the true Southern styled rolled dumplings. This looks positively heavenly! How much water do you recommend using to cook the chicken in? 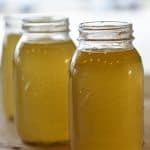 How much broth do you use? I pre-cooked my chicken so wanted to start after the boil chicken step but am not sure how much broth to add the chicken to. What is a instant pot? It’s a type of pressure cooker. Thanks Deborah! do you boil the chicken in just water or in broth? and how much? Thank you, I cant wait to try this as well as your slow cooker beef stew! I know this might sound strange but I add some white peppered gravy mix to my broth after dumplings are added. This makes it so good. How much broth should be in the pan when you start dropping dumplings in? About how much water should I cook the chicken in? Robyn, when my grandmother died, her dumpling recipe went with her. I have tried many times to replicate her recipe. While the recipes I tried were good, they were never like granny’s. Well, that is until I found your recipe. Your picture captured me first. I thought, that looks like my granny’s dumplings. So, I had to try your recipe. Girlfriend, when my daughter took a bite, she said, “Mom, these are like granny’s”. I love to cook and so does my daughter (age 24). I really enjoy your blog. 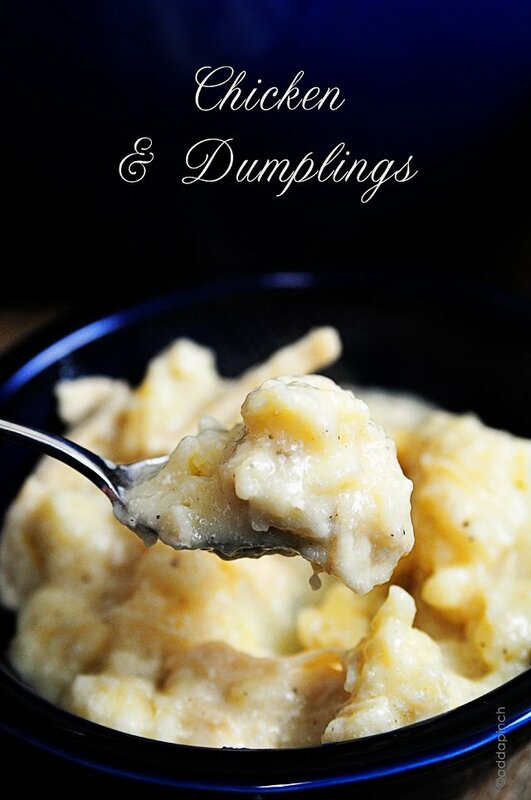 Chicken & dumplings were always a tradition at Thanksgiving and Granny’s were the best. Now, thanks to you, the tradition lives on. Happy Thanksgiving Robyn! I was wondering because the recipe does not say what size whole chicken to start out with, can the dumplings be frozen if there are too many? Thanks so much for your feedback, Cathy! I’ve updated the recipe to answer the questions you brought up. Great points! I appreciate it! I can not thank you enough for sharing this recipe! I made it over the weekend and it was out of this world. My whole family enjoyed it so much that my 9 year old asked me to make it again tonight for our dinner. THAT never happens! What size Dutch oven do you use? I add a little carrot and celery to the broth and drop the dumplings by teaspoinfuls. Can’t beat it. Yummy! Are you cutting in the shortening when making the dough for the dumplings, or just mixing them together? I have no idea how to cut in shortening, but a lot of these classic recipes usually say this, so I just wanted to ask. I have found that a lot of recipes will not mention some basic steps because most people are aware of the steps inbetween, but this cooking noob is not. 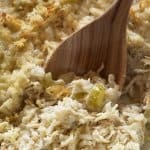 My family loved your grannys recipe wonderful clean simple flavors will make again! my dumplings fell apart more then I would like I think I underworked my dough. I have been working on Chicken an dumplings my entire married life. I LOVE your recipe. My question is mine often become too much like soup an not a thick broth. I am sure it has to do with the amount of water I start with…and then sing two cups of milk. The next time you make it, could you give me an idea of the number of cups of broth you have before you ad the dumplings? I would greatly appreciate it. Yes, And it was great!! Making it again this,weekend for my daughter and grandkids. Thank You for a great recipe. So happy you enjoyed it Danny! 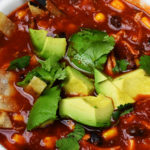 Such a special recipe to me and glad to hear you are making for your family! Thanks! What is the measured amount of broth before adding the dumplings in? As noted in the first part of the recipe instructions, you will cover chicken completely with water, plus about 3 inches more water. Hope you enjoy it, Wayne. Thanks!